When Berlioz accepted the terms of a second visit to Russia in 1867, it was in order to conduct six concerts in St. Petersburg. Once he arrived, however, enthusiasm was such that he was persuaded to give two further concerts in Moscow. The first of his Moscow concerts, given on 8 January 1868, became an event quite without equal in the composer’s life, a concert-monstre with five hundred musicians, before an audience estimated at 12,600, and held at the only suitable venue on that scale, the Manezh (Manège = riding school) in central Moscow . Heretofore, descriptions of that concert were Berlioz’s own, as conveyed in his letters to Berthold Damcke and, in almost the same words, to his niece Nanci Suat (nos. 3326 and 3327 in vol. 7 of the Correspondance générale). In a Russian periodical, Sovetskoye Iskusstvo (no. 45, 29 September 1937) appears what purports to be an eyewitness account of the Manège concert from the point of view of a twelve-year-old boy, recalling the event after sixty years. Adding interest to this memoir is the fact that the author himself was far from unknown – in another field. Aleksei Vasil’yevich Oreshnikov (1855-1933) had been an internationally famous numismatist and writer on antiquities. Count Oreshnikov came early to the skills in modern and ancient languages which enabled him to travel in the lands of classical antiquity and begin to form the collections of Greek and Roman coins which he later donated to Moscow University and to the Roumyanzevsky (now Pushkin) Museum of Fine Arts. Oreshnikov held the post of custodian at the Historical Museum of Moscow for almost half a century, publishing over 130 works on numismatological and related subjects. I once saw Berlioz in person. I managed to attend his third and last concert in the Manège1, or the Exerzierhaus as it was called in those days, and I preserve him in my memory as vividly as if it were yesterday and not 62 years ago. I witnessed him performing excerpts from his Faust and Roméo et Juliette and from other works of his2. The Manège was crammed when I arrived, accompanied by my parents. The building struck me as enormous. Merchants, many of whom seemed on cordial terms with my father, filled the boxes. The audience was made up of people of all kinds. My attention was drawn to a group of about 70 peasants who had been the former serf musicians of the Princes Golitsyn3. There were also many military men and ladies bedecked with jewels. In the third row to the right of the stage my father recognised the actors and actresses from the Maly Theatre occupying their seats: Samarin, Shumsky, Akimova, and others4. I had already had an opportunity to see the first two of them performing. Many academicians and conservatory professors attended and were passing among the rows of benches. My father pointed out N[ikolai] G[rigor’yevich] Rubinstein5 to me, walking arm-in-arm with Prince V[ladimir] F[yodorovich] Odoyevsky6 and Herman Augustovich Laroche7, the music critic, with whom I later lodged in Petersburg. The musicians were seated upon the stage, tuning their instruments. Three harps standing to one side caught my attention. I had never seen them before. The commotion in the audience and the orchestra was inconceivably loud. The audience were asked to take their seats. Little by little they fell silent. When the musicians had also settled down, Berlioz appeared on the stage. This did not affect me at all at the time, but now I recall his first appearance with emotion. In my memory I treasure the recollection of Berlioz as of a thin figure, elegantly dressed all in black. He looked stooped as he approached the conductor’s stand; but as soon as he reached it, his back straightened and he returned a bow to the audience. His hair was very striking. He wore a white waistcoat and had a baton in his hand8. Upon his arrival, the musicians rose immediately from their seats and commenced a musical flourish. The deafening applause and cries of greeting cheered Berlioz greatly. At once he straightened up again, seemingly rejuvenated, and his head became even more impressive. He bowed once more to the audience, who sustained their applause, and to the musicians, who stood by their places. The cheering continued; the audience seemed beside themselves. Full of impatience, I was eagerly awaiting the moment when the orchestra would break into its thunder and roar, but the applause would not end. Berlioz bowed his thanks repeatedly, and the orchestra continued its fanfares. Finally, the noise began to diminish. The musicians froze in place, and I heard the first sounds of music. Someone whispered, "He leads the orchestra without a score", which I did not understand at the time. Only some years later did I grasp what they meant. Loud sounds came from the orchestra, and stormy themes and tender melodies, but nothing to resemble the crashing and thundering I had been led to expect. It is true that I understood very little at the time of what I heard that night. Even now I shudder when I recall the unexpected entry of the brass. It startled me when they launched into the Tuba Mirum9. Overwhelmed, the audience yielded to this extraordinary effect. I still remember the ball scene from Roméo et Juliette, which astounded me with its melodic beauty. Triumphal acclaim followed the final chords. Berlioz was deluged with flowers. Ecstatic cries of enthusiasm went on and on. The ovations were unrelenting. The musicians were striking the soundboards of their violins and cellos10. Nowhere else, it was later reported, had Berlioz ever enjoyed such a reception and achieved such success. Berlioz had but to leave the stage for the audience to recall him. Deserting their boxes, they thronged around the stage forming a dense crowd. The vast Manège was packed to the seams. I was an adventuresome and curious lad. I managed to slip up to the stage and was able to catch a glimpse of Berlioz within hailing distance. He looked pale. His grey hair seemed faded, the colour of ashes. Stooping, and with a thin hand, he pushed back his hair which had fallen onto his forehead. After he stepped off the stage, the audience once again burst into their unceasing applause and cheering until Berlioz appeared anew. He approached the musicians, shaking hands with some, and, after saying "spasibo" in Russian11, began bowing to the audience, who replied with yet another violent outburst of enthusiastic "hurrahs" and "bravos." From all sides they shouted, "Come back," in Russian and French. And I beheld two heavy tears that rolled from Berlioz’s eyes. After returning a low bow to the audience, he left quietly. Much later, when I had read the writings of Vladimir Vasil’yevich Stasov12, I grasped what these tears of Berlioz had meant. Nowhere did he encounter such a reception, nowhere did he enjoy such affection from an audience as at his final concert in Moscow. France did not acknowledge him and even showed contempt towards him, whereas in our country, where public musical appreciation was late to arrive, the progressive-minded Russian musicians revered this unloved son of France. They accepted him as a foremost composer; and, at the edge of his grave, they let him sense that he was a great artist and that he had been understood. People thronged about the exit. We observed Berlioz wearing an overcoat, with a hat on his head and a dark scarf around his neck. Prince Odoyevsky was guiding him arm-in-arm – that very same Odoyevsky to whom Berlioz later addressed his letters13. Long afterwards, I searched for Berlioz’s grave at the Cimetière Père Lachaise in Paris14, where many of the great sons of France are buried, only to learn to my surprise that Berlioz reposes in the Cimetière de Montmartre. The custodian of the cemetery, who had witnessed Berlioz’s burial, told me that only nineteen persons shepherded the coffin of the great musician through Paris. Not long before, 60,000 people had accompanied Rossini to his final resting place15. Poor Berlioz! To pass away in oblivion and impotence! Recognition came too late. In Paris I saw a statue in his honour. * A vast enclosed structure built in 1817 in the wake of Napoleon’s retreat in order to house equestrian exercises. At 112 metres in unobstructed length and 45 metres in width, the Manège was said to hold two mounted regiments at one time. In modern times, the Manège was used for large exhibitions until a disastrous fire consumed the wooden roof on 14 March 2004. It has been restored and reopened as an exhibition hall on 18 April 2005. 1) Oreshnikov’s memory misleads him. In 1868 Berlioz gave two concerts in Moscow and it was the first of these, which took place in the Manège. 2) From a distance of sixty years, Oreshnikov has probably forgotten that Berlioz did not play an excerpt from his Faust that day (for the full programme see Berlioz in Russia, Moscow). 3) The Golitsyns were descended from an ancient Russian nobiliary family. Emancipation of the serfs had occurred only seven years previously, in 1861. 4) Established in the mid-18th century, the Maly Theater bears its present name since 1824. Moscow’s oldest dramatic company, it made a specialty of staging Russian classics: Alexander Griboyedov, Nikolai Gogol and Alexander Ostrovsky. Ivan Samarin (1817-1885) became famous for the character of Tchatsky and, later, Famousov in Griboyedov’s "Distress from Cleverness". Sergei Shumsky (1820-1878) made his name for playing Turgenev and Sofia Akimova (1821-1889) was an illustrious character actress. 5) Nikolai Grigor’yevich Rubinstein (1835-1881). A celebrated pianist, conductor and teacher, he founded the Moscow branch of the Russian music Society and in 1866 established the Moscow Conservatory. The composer Anton Rubinstein was his brother. 6) Prince Vladimir Fyodorovich Odoyevsky (1804-1869). Writer, philosopher, and scientist, Odoyevsky was a direct descendent of medieval Russian nobility, an aristocrat who nevertheless dedicated his life to public service, especially in the areas of school reform and literacy. His circle of friends included Pushkin, Gogol, and Turgenev, and in music Glinka. Odoyevsky met Berlioz in 1847 and wrote enthusiastically about his first concert in St. Petersburg. Once again involved in musical matters in the 1860s Odoyevsky welcomed the composer on his second visit in 1867-68. 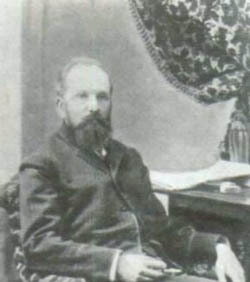 7) Herman Augustovich Laroche (1845-1904). A precocious music student and classmate of Tchaikovsky, Laroche went on to become a prolific if conservative musical journalist and essayist. It was Laroche, who, together with Prince Odoyevsky and Tchaikovsky, would deliver a reception speech in Berlioz’s honour at the Conservatory a few days later. In subsequent years Laroche promoted staging of Berlioz’s operas in Russia; and one of his last articles, dated 1901, was titled "Berlioz, the Forgotten" ("Berlioza zabyli"). 8) Oreshnikov’s description of Berlioz’s dress and appearance closely matches the photograph taken by Sergey L’vovich Levitsky (1819-1898) when Berlioz was in Russia. 9) Impressions of later concerts must have merged in Oreshnikov’s memory with those of his youthful experience at the Manège. Berlioz did, indeed, play an excerpt from his Requiem, but it was the "Offertorium", not the "Tuba mirum" as Oreshnikov would have it. "Hardly had the last chord sounded when an appalling hubbub engulfed the hall. The entire audience were shouting, in the stalls, in the boxes, everywhere, and trombones, horns and trumpets blaring out fanfares in a selection of keys, energetically accompanied by the clatter of bows on the wood of the stringed instruments and the din of percussion. The German language has a word to designate this peculiar way of applauding. (*) My first reaction was one of anger and abhorrence: they were spoiling the musical experience I had just been enjoying. For a moment I almost hated the players for choosing such a deafening method of showing me their appreciation." "Tell me," [King Friedrich Wilhelm IV] asked, "did you learn Russian?" "Indeed, sire. I can say ‘Na prava, na leva’ (to the right, to the left) when directing the driver of a sledge, and I can say ‘Dourack’ when he takes the wrong turning." "And what does ‘dourack’ mean?" "Ha! ha! ha! ‘Idiot, sire’! That’s very good. ‘Idiot, sire’!" 12) See: Stasov, Vladimir, "Liszt, Schumann and Berlioz in Russia", in Vladimir Vasilevich Stasov Selected Essays on Music. Translatred by Florence Jonas (London: Barrie & Rockliff, 1968). 13) The Berlioz-Odoyevsky letters, published in two Russian journals, are of doubtful authenticity. Two of the letters mentioned, were featured in Sovetskoye Iskusstvo (no. 45, 29 September 1937, p. 4) alongside Oreshnikov’s recollections. The remaining ones, four in number, appeared in Sovetskaya Muzyka (no. 8, August 1969, pp. 62-8) as a contribution to the Centenary of Berlioz’s death. In 1975 John Ahouse brought them to the attention of English-speaking readers in the Berlioz Society Bulletin (London: no. 88, 1975, pp.15-20; no. 89, 1975, pp. 13-20). 14) None of Berlioz’s major biographers is specific about the number of mourners who actually reached the graveside after the long walk uphill to the Montmartre cemetery (following the memorial service at the Église de la Trinité). Jacques Barzun, however, mentions "the Institute delegation in uniform and a considerable following [who] marched behind the hearse" to reach the composer’s resting place, where several additional orations were given. 15) Rossini died on 13 November 1868 at his villa in Passy and was buried at the Cimetière Père Lachaise in Paris, but in 1887 his remains were transported to Italy to the memorial at the Santa Croce Church in Florence. 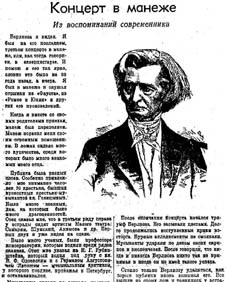 We are most grateful to our friends Elena Dolenko and John Ahouse for sending us this annotated English translation of Aleksei Vasil’yevich Oreshnikov’s recollection of Berlioz’s first concert in Moscow in 1868. Please see Концерт в Манеже for the original Russian language of the article. The Hector Berlioz Website was created by Monir Tayeb and Michel Austin on 18 July 1997; this page created on 18 August 2005. © 2005 Elena Dolenko and John Ahouse. All rights of reproduction reserved.